Known as Flip Effect Chaos or Chaos Turbo, this Goat Format deck focuses on (a) maintaining card advantage through discarding floaters (b) summoning Chaos Sorcerer quickly using the ample graveyard fuel this deck provides to convert this card advantage into field advantage. It doesn’t use Metamorphosis, Scapegoat or a lot of beaters because it’s focused on achieving its specific goals and isn’t made to be spread thin. Book of Moon is strong on nearly every monster in this deck whether it is to re-use a flip effect or to protect Chaos Sorcerer from cards which target face-up monsters. 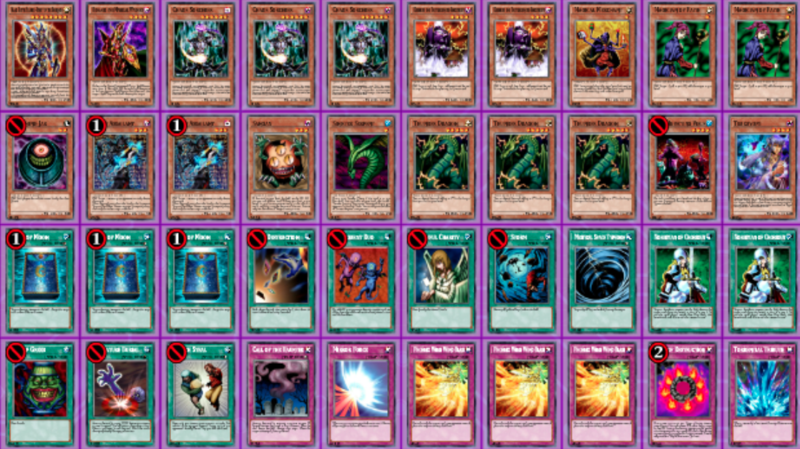 Tsukuyomi abusing the flip effects in this deck is also another boon. Both of them can address Thousand-Eyes Restrict, one of the bigger weaknesses this deck would otherwise suffer from. Thunder Dragon helps Sorcerer meet the LIGHT requirement more consistently, on top of offering free discard fodder. Night Assailant being able to retrieve another copy of itself essentially makes any discard cost (such as Tribe-Infecting Virus and Phoenix Wing Wind Blast) free. Card Destruction, Graceful Charity and Morphing Jar three big cards that enable this deck to convert its floaters into real card advantage over the opponentswiftly summon. Apart from Chaos monsters, this deck has very little offensive power or backbone. It relies on card advantage to win on attrition, otherwise the opponent can pressure this deck down by brute force. It relies on Chaos monsters in order to establish field presence, and the deck is in trouble if they can’t summon them early enough. Also, the potential to brick: drawing Chaos monsters too early or drawing cards which utilize discards (like Phoenix Wing Wind Blast) without drawing into Thunder Dragon or Night Assailant. This deck can be incredibly power, and at its best, gain lots of card advantage. Plussing off of a Graceful Charity early on can put the deck in a good position, but the deck can also equally lose games if it doesn’t draw into its draw power. Due to having a simple playstyle and being reliant on luck, some players view this deck type in a negative light.